It is popularly known latex that comes from the bark of dragon’s blood trees, with the name of “sangre de grado” or “Grado’s blood”, of the genus Croton (C. lechleri), make deep cuts in their outer shell when they are laid down on the floor (cut until they fall). These trees are of medicinal interest, belonging to the family Euphorbiaceous and reach a hight of up to 25 m high and 55 cm thick. In Peru, various speciesod dragon´s blood grow in the jungle and the low jungle, in the departments of San Martín: in the pongo of Cainarache; Huanuco: Chinchao area; Junín: in the Valley of Chandigarh, Loreto: in Yurimaguas and in some areas of Cusco. Extraction or “harvest of the latex” is from when the plant is 5 years old. The name “sangre de grado” latex, is due to its similarity in color and density to human blood in a way that when a few drops are freshly extracted, they are collected on a finger, and they gives the appearance that the person has suffered a cut, the blood is a reddish liquid. The dragon’s blood latex contains an alkaloid called “taspine” which accelerates healing of wounds, lacerations and abrasions. The resin also has anti-tumor alkaloids like pyridone aporphine indole, quinoline, tropanes, and unsaturated fatty acids, anthraquinones and triterpenes. Among its most important effects I must emphasize its activity as an astringent healing and hemostasis, by allowing it to effectively treat different types of skin wounds and mucous membranes, including those which have difficulty with other treatments such as varicose ulcers or decubitus. It has also been demonstrated to have antibacterial, antifungal and antiviral properties,, which would improve their effectiveness in the above treatments. The quality of our products reflect the complete organic process of dragon’s blood ; beginning with our growers in the amazon zone(Pucallpa in Peru). Dragon´s blood is one of the most used at the grassroots level in the humid tropics of Central and South America. 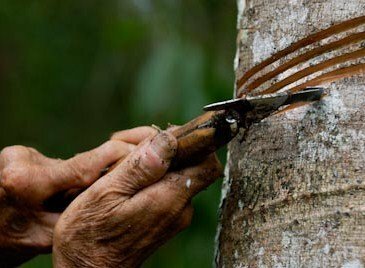 The first written references date back from the seventeenth century when the Spanish naturalist and explorer P. Bernabé Cobo discovered the healing properties of this latex, widely known by indigenous tribes of Peru and Ecuador its mainly used for healing. It also has anti-inflammatory, antiseptic and hemostatic properties, it also has the added benefits for the treatment of diarrhea. And is used to treat gastrointestinal ulcers, uterine cramps and in cases of urinary retention, (when taken in small doses). In addition, it is credited with anti-cancer properties. Other indigenous uses include, treating fevers and digestive pyorrhea it’s used in vaginal baths before delivery to postpartum hemorrhage. About 8 drops are used in all these indications of folk medicine (although, even doses of 20 to 30 drops are reached), which are usually added to an infusion made by any aromatic plant. In the countries of origin it’s common to find this latex in various trade shows, many in liquid form or incorporated in various diverse preparations . helps in the formation of scabs and quickly regenerates the skin helping collagen formation and it has been shown that the to latex is more active than its isolated components. numerous studies support the antiviral activity of dragon's blood, mainly the SP-303. In vitro experiments show that this proanthocyanidin inhibits various DNA and RNA viruses including herpes viruses, hepatitis (A and B), the influenza virus and Para influenza virus. The dragon's blood sample obtained from Croton lechleri by hemolytic assays in vitro, a potent inhibitory, the activity of the classical and alternative pathways of the complement system, However, the effect of the latex is more than the taspine, having inhibition of the classical pathway and shows no effect on the alternative pathway. Sangre de Drago has a dual (antioxidant and pro-oxidant) activity. It is seen as the main purpose in the use of Sangre de Drago, its healing effects, internal and external. Excessive use of latex can cause constipation, blindness, stomach and circulatory disorders. Do not use on discriminated minds or on large wounds caused by burns, the cytotoxic activity of the taspine; used in duodenal ulcer can cause liver damage. For external use/ the resin sap is rubbed directly onto the affected area several times a day and the area be allowed to dry, Note: the resin is red! It temporarily stains the skin a reddish-brown (it can be washed off), but it permanently stains clothing. Rub the resin in the palm of your hand and directly applied when the resin is thickened to form a thin paste, light in color, which also helps to form a second skin on top of a wound or rash and reduces the stains. For internal use, the traditional remedy is 10-15 drops in a small amount of liquid, take 1-to 3 times a day (be prepared, however, it tastes is very particular). - Vaginal disorders: Dissolve 20 drops in 20 ml of warm water. Drink once a day for 10 or 20 days. Complete treatment by washing with the resin solution and water. - Depurative: Dilute three to five drops in a little water or fruit juice. Drink one glass per month, three months and then rest repeat if desired daily. - Minor Injuries: Soak a piece of sterile cotton with resin. Clean the wound directly, apply the resin. Do not apply when the wound is festered. - Gastric ulcers: Dissolve one teaspoon (5ml) of resin in a glass of warm water, take a drop on the first day, the second day 2 drops, 3 drops on the third day and so on until day 20 in which 20 drops are taken, continue taking 20 drops daily for 15 consecutive days, then decrease gradually until only one drop per day; stop for 15 days and if the ulcer has not totally healed start the treatment again..
- Varicose ulcers: Direct use. Apply gently to the wound using a clean, sterile cotton bandage, leave until the next day and repeat the treatment. The dragon´s blood has different presentations according to their different processes, but has proven effective in each use.